Physio Logic Physical Therapist, Dr. Sarah Kostyukovsky, PT, DPT, OCS, and new mother, discusses how the physical changes that occur during the pre and post-natal period can lead to injury and chronic pain. 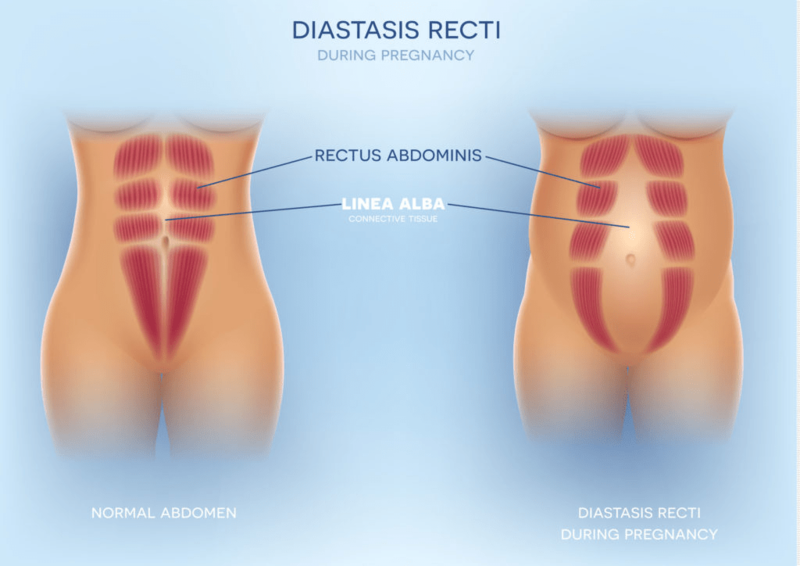 Diastasis recti during pregnancy, also known as diastasis rectus abdominus or abdominal separation, it is common among pregnant women and post birth, in which a gap forms between abdominal muscles. I recently read an article in the Boston Globe about the significant brain changes that occur during pregnancy and child birth. As a physical therapist and new mother, this new research on the maternal brain made me think about the significant physical changes that occur during the pre and postpartum periods, and how these physical changes influence our musculoskeletal health. My son is now 9 months old, and I am still grappling with my own postpartum body changes and pain. I naively thought that doing my prenatal yoga and staying active during my pregnancy would make my postpartum recovery easy. I had no idea what a toll pregnancy, child birth, and postpartum changes would take on my own body. Studies suggest that 50% or more of pregnant women suffer from low back pain, and for more than a third of these women, the pain lingers for months postpartum. Though low back pain is the most common complaint, there are many more musculoskeletal issues that can affect women during the pre and postnatal period including pelvic girdle pain, hip pain, and wrist/hand pain. Though these complaints are common, they are not a normal sequelae of having a child. Given the strong mind-body connection, I am certain that the brain changes of a new mother affect our physical health as well. As a PT who treats pregnant and postpartum health in women, I know that not enough women are getting guidance and treatment on their mental or physical state. We are unfortunately seeing a lot of women after months or years of having a baby that have been dealing with chronic pain or develop acute pain from trying to return to an exercise routine that their bodies are not ready for. As a healthcare professional and a new mother, I feel a responsibility to provide education, care and support following the monumental physical and mental changes that occur on the journey to motherhood. If you are interested in more education, Physio Logic will be hosting a Pregnancy and Postpartum Health and Wellness Workshop this Fall. Interested in learning more about pre and postpartum health? Schedule an appointment with one of our Doctors of Physical Therapy today. Fill out the form below to get started. If you were referred by a family member or friend, please provide us with their name so we may thank them. Save time with a complimentary insurance verification before your appointment. Yes, I want a complimentary insurance verification done for me.